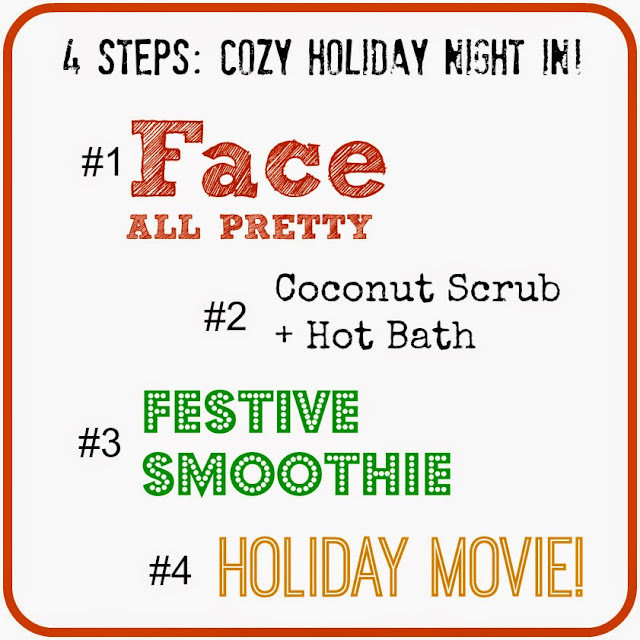 Peppermint Stick Shake + My 4 Steps to a Cozy Night In. Video! It is all twirling by so fast. This holiday season thing. I want more Santa hats, mulling spices, marshmallows, candy canes, Christmas cookies, holiday music and jolly parties. More holiday-ing. So far, I will confess to you, that I have barely spent half a day Xmas shopping, but I have spent more hours than I can count laughing with friends. I have been lucky to cross paths with so many groups of my girl and guy friends these past few weeks. Forget Christmas cookies, those experiences, giggles, long chats, smiles and hugs are food for my soul, I tell you. My mug is full. So as 2014 fades away, I am going to embrace this happy feeling that has been buzzing around me lately. Lets call it joy, just to be all festive. And I hope you are living it up with me. Are you? I mean, really, are you? You deserve more than shopping stress, frazzled nerves and omg-I-am-way-too-busy feelings this season. You deserve something magical. Special. You deserve COZY. So lets..
Finding Cozy. I hope you can chill out, calm your spirit and just have one thing.. a cozy holiday night inside. My favorite thing to do during the holiday season is to stay inside with the twinkly lights, music, family, friends, movies, warm mugs or a frosty peppermint stick shake. 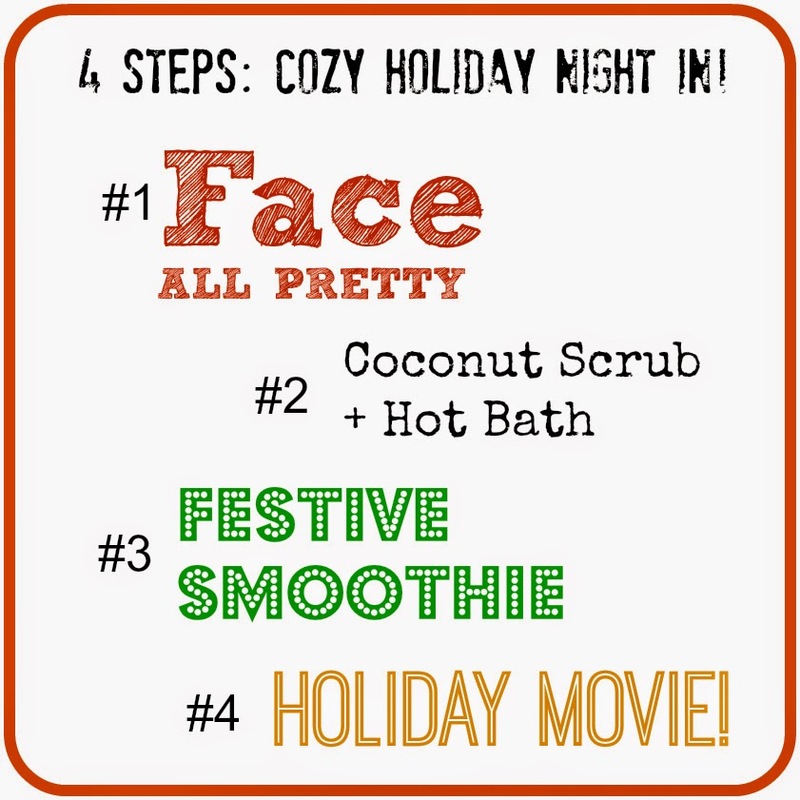 Today I share a healthy treat recipe and my 4 Steps to a Cozy Holiday Night Inside, via a video. Cozy Holiday Night How-to! Today I pull on my soft penguin pajamas and teach Cobi and Whitney how to get cozy this holiday season, in just four steps. Plus we share our favorite holiday movies! What is your favorite holiday movie??.. 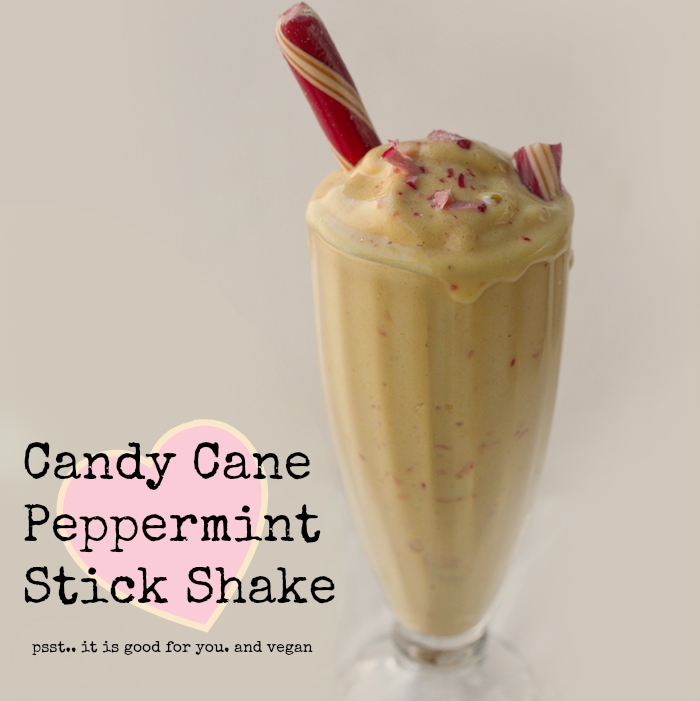 Peppermint Stick Shake Bliss. My favorite ice cream before I was vegan was always that bright pink "peppermint stick" flavor that you would find around the holidays. Well this shake is my vegan version of that! I like to make it really thick by adding very little non-dairy milk and some frozen watermelon for extra frostiness. Sometimes I will use coconut milk as the liquid for an extra rich dessert shake. 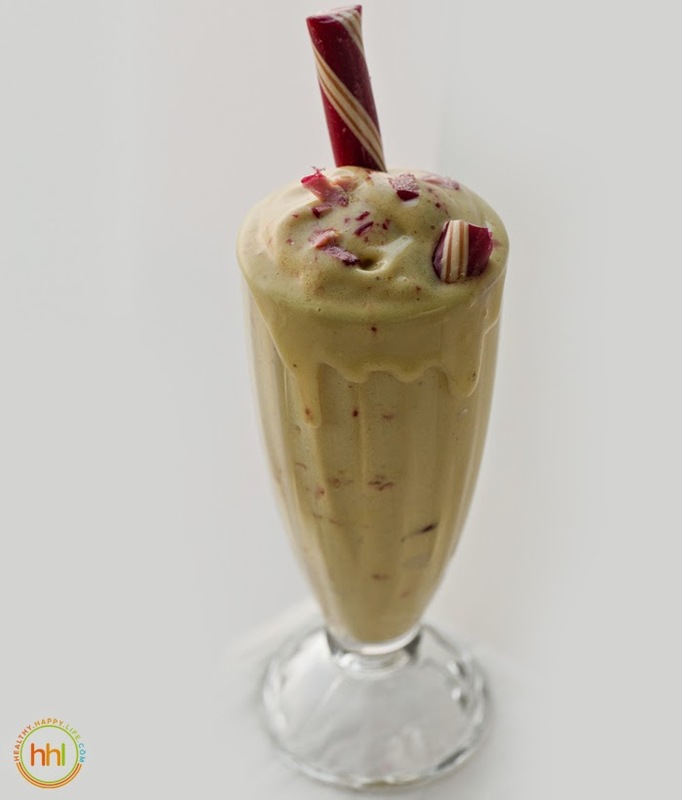 I love the sweet candy cane flavor and creamy, calming texture of the banana ice cream. 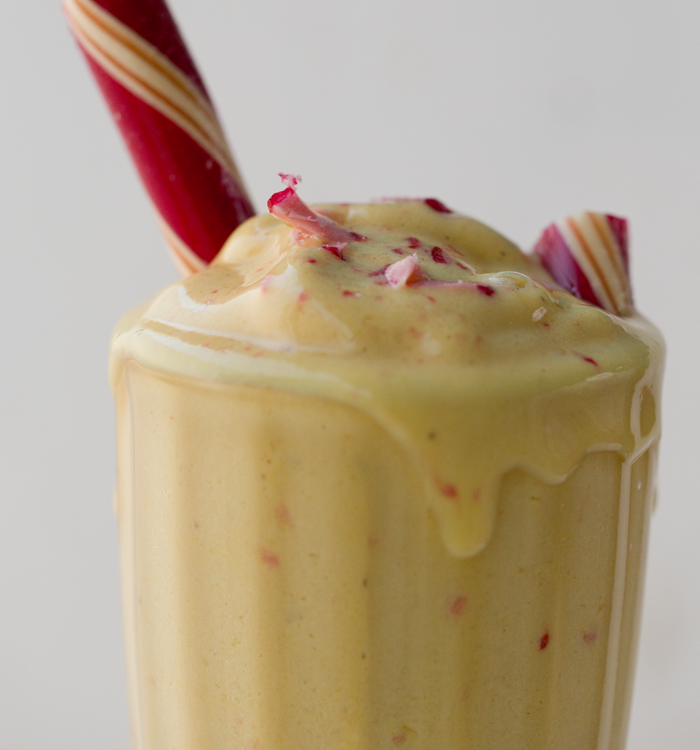 Cozy up to this festive smoothie recipe.. 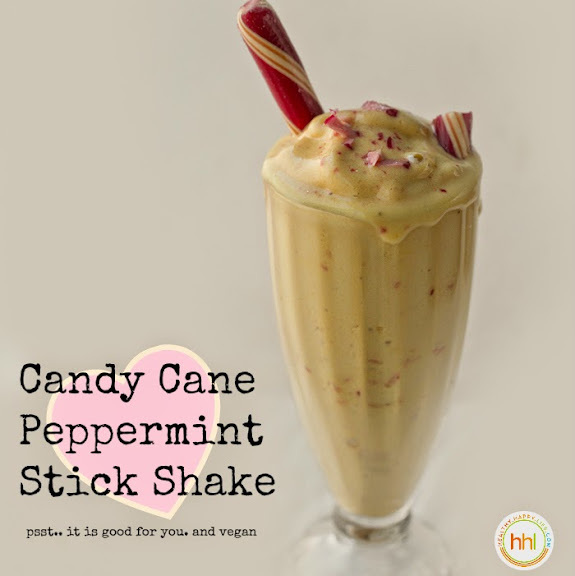 This frosty candy cane shake is a healthy delicious holiday treat. 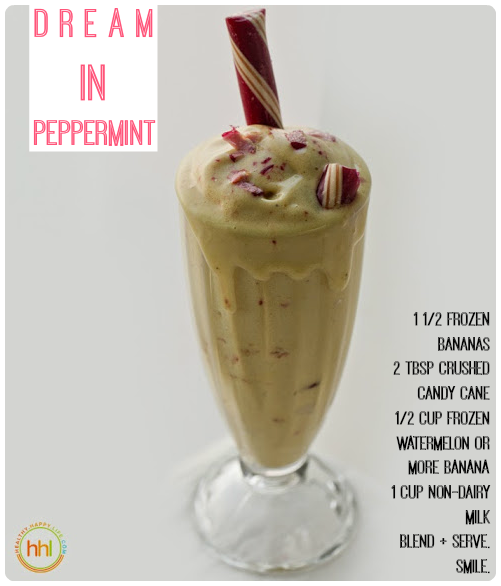 Snuggle by the fire and enjoy this minty shake! Add all ingredients to a high speed blender like a Vitamix. Blend from low to high until smooth. Tip: Use less liquid for a super thick shake - or add more frozen banana. Serve with a garnish or freshly crushed candy cane on top.